The Vietnam Cross of Gallantry is the equivalent of the French Croix de Guerre. The VCOG was originally authorized only to specific individuals and units. In May, 1974 the Government of (South) Vietnam (Republic of Vietnam) authorized the VCOG all foreign military personnel and units for valorous achievement/participation during the Vietnam conflict, March 1, 1961 through March 28, 1973. In April 1975 the GVN re-authorized the VCOG to all foreign military personnel who served in Vietnam until the end of the war, including foreign personnel who risked their lives in the final evacuation operations (General Order 8, MACV). 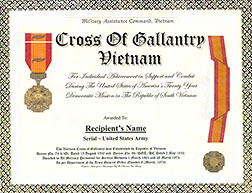 All recipients of the Vietnam Service Medal and Armed Forces Expeditionary Medal (Vietnam) are also authorized the Vietnam Cross of Gallantry. Authorized by the Government of (South) Vietnam (Republic of Vietnam) in May, 1974 to all foreign military personnel and units for valorous achievement/participation during the Vietnam conflict, March 1, 1961 through March 28, 1973, and re-instituted for the final years to 30 April 1975. 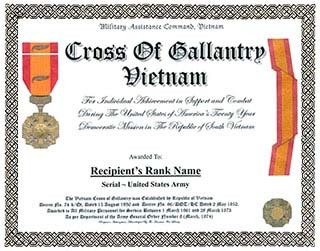 The Vietnam Cross of Gallantry is the equivalent of the French Croix de Guerre. 1. Description: A Gold color medal, 1 3/8 inches in width, consisting of a wreath superimposed by two crossed scimitars saltirewise and a Maltese cross. In the center of the Maltese cross a disc with an outline of the country of Vietnam between two palm sprigs joined at the bottom and a scroll overall inscribed "QUOC-GIA LAO-TUONG" (Reward of the State). 2. Ribbon: The ribbon is 1 3/8 inches wide and consists of the following stripes: 3/8 inch Old Glory Red 67156; center 5/8 inch Golden Yellow 67104 with 16 strands of Old Glory Red; and 3/8 inch Old Glory Red. 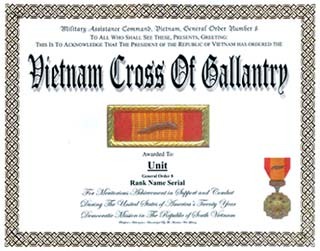 The Vietnam Cross of Gallantry is represented in four components: 1) the full size medal, 2) the miniature medal, 3) the individual (frameless) ribbon and 4) the (framed) unit ribbon. (Pins, badges are not authorized components.) The fifteen-inch ribbon for display of the VCOG around the neck remains restricted to Vietnamese military personnel and is not authorized to non-Vietnamese (Allied/Foreign) military personnel. Recipients of the Vietnam Service Medal assigned to units that were not stationed in-country are not eligible for the Gallantry Cross unless authorized individually by name or unless authorized by unit name (not directly subordinate to MACV) from the Government of Vietnam. b. Prior History: The VCOG was originally awarded by the Vietnam Government to military personnel both individually and as members of awarded units who accomplished deeds of valor or displayed heroic conduct while fighting the enemy and have been cited individually at the regiment, brigade, division, corps, or armed forces level. The medal is now authorized (Sec. a) to all recipients of the Vietnam Service medal. e. Full-Size Medal Display: The full-size medal is provided in the standard-length by United States manufacturers for wear on civilian clothing or all non-Vietnamese military uniforms. The 24-inch neck ribbon common to Vietnamese medals is authorized only to Vietnamese military personnel. United States manufacturers of the full-size medal may produce the ribbon only in the standard 1-inch to 1.75-inch length. 5. Background: a. The Vietnam Cross of Gallantry is the equivalent of the French Croix de Guerre. The RVN Gallantry Cross was established by the Vietnam Government by Decree No. 74-b/Qt, dated 15 August 1950 and Decree No. 96/DQT/HC, dated 2 May 1952. Authorization for all U.S. Army personnel was confirmed in HDQA General Orders No. 8, dated 19 March 1974. Authorization for other branches of the military defers to the Army authorization date. b. 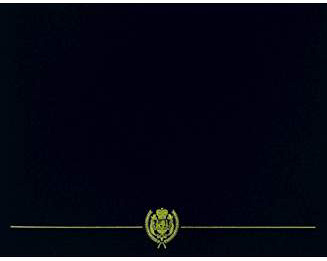 Only one emblem (with palm) will be worn regardless of the number of times the unit was awarded the RVN Gallantry Cross. The Army initially authorized the wear of a fourragere by letter AGPB-AC, Subject: Wear of Vietnamese Unit Awards by U.S. Army Personnel, dated 11 February 1969, for units which had been awarded the RVN Gallantry Cross with palm on two or more occasions. Department of the Army message 111030Z April 1974, established the policy that only one emblem was authorized, thus precluding the wear of the Vietnamese fourrageres which represented multiple awards. RVN Gallantry Cross Medal w/Palm Instituted: 1950 Criteria: Awarded for valor and heroic conduct while fighting the enemy. Notes: Palm device is citation for unit awards & for medal award at Army or higher level. RVN Gallantry Cross Medal w/Gold Star Instituted: 1950 Criteria: Awarded for valor and heroic conduct while fighting the enemy. Notes: Gold Star device is for citation at the Corps level. RVN Gallantry Cross Medal w/Silver Star Instituted: 1950 Criteria: Awarded for valor and heroic conduct while fighting the enemy. Notes: Silver Star device is for citation at the Division level. RVN Gallantry Cross Medal w/Bronze Star Instituted: 1950 Criteria: For valor and heroic conduct while fighting the enemy. Notes: Bronze Star device is for citation at the Brigade and Regiment levels. The following myth was imposed by US servicemen during and after the Vietnam War: "When awarded to individuals it was awarded with Silver Star (the equivalent to the US Army Silver Star) or with Bronze Star (equivalent to the US Bronze Star)" This myth is has been permitted to continue only because the Vietnamese government no longer exists and the declining number of Vietnam vets renders this widespread myth unnecessary to enforce.